If Booster Gold stole two super powers and then stole ten more, how many super powers has he taken in all? Last week's biography of Trixie Collins led to some discussion of whether she might be Booster Gold's wife and Rip Hunter's mother. Frankly, I can only guess. 2. She has blond hair. So who is she? Who will Michael "Booster" Carter one day love and trust enough to reveal all his secrets to? Who would join him in his sworn duty to save time itself from any and all threats? Or could it be someone we haven't met yet (or maybe even someone else we have)? What do you think? This week's poll question: Who was Booster Gold's wife in Time Master: Vanishing Point? Please visit the Boosterrific Polls page to view results for this week's poll. If we're considering blondes, how about Leri Lee from the Linear Men? Also I can't find the reference now but I thought somewhere in Booster Vol 2 was a shot of Rip's mom working a computer at Vanishing Point and she had red hair. 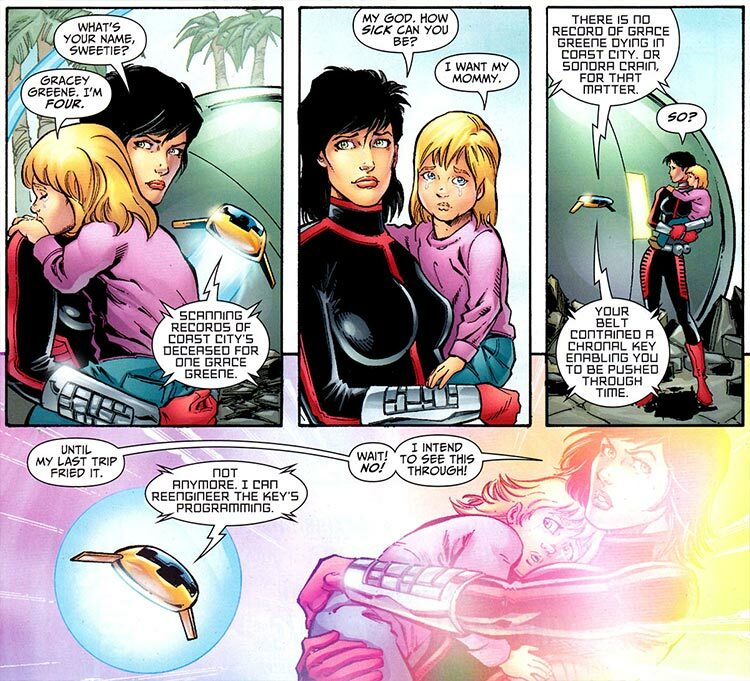 I also agree with Herb, PG as Booster's wife would make for a great story! Especially if written by Giffen and DeMatteis. Kevin, the panel you're thinking of is in TMVP #6. That issue also makes it pretty clear that Liri Lee is not Booster's wife. I do have a theory. I'll give it to you on Friday. I had someone once suggest Michelle as Rip's mom and I couldn't even form enough of a coherent sentence to tell them how much this wasnt Marvels Ultimates universe. Yall cant also forget all the theories Rip is Ted and Boosters kid! Cause ...that's how babies are made. I believe that there are 52 different alternatives. it's probably someone that we haven't met. The most likely candidate is Trixie. But I would like it to be Leri Lee. One of the things that me and my buddies use to talk about was that maybe its Blair Butler. Being a that time travel is involved it's possible that we have met her but that she was underage when we met her. When next we meet her she could be all grown up and in love with our hero. Jesster, I like the way you think. If you had two Booster Gold autographs and Booster gave you four more, how many autographs do you have?